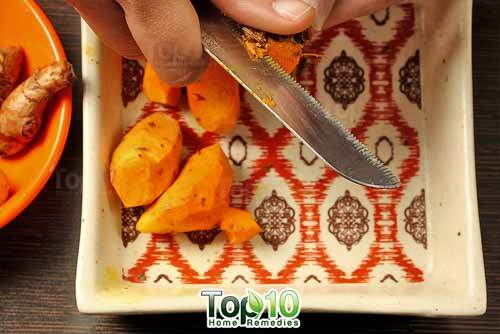 Turmeric is an integral part of Indian and other cuisines of Asian countries. Along with its use as a cooking ingredient, turmeric plays a prominent role in herbal medicine. There are more than 300 antioxidants as well as other nutrients in turmeric that offer many health benefits. Along with turmeric powder that is readily available in the market, you can use raw turmeric juice to reap its health benefits. According to the University of Maryland, the recommended dosage of turmeric powder is 1 to 3 grams (½ to 1½ teaspoons) daily. Also, the roots of the turmeric plant are used in preparing herbal medicines. Fresh, raw turmeric looks like ginger. The outer skin is brown and the flesh has a deep orange color. Turmeric root has a peppery, slightly bitter flavor. Fresh turmeric root is available at health food stores. It is very simple to extract its juice. 1. 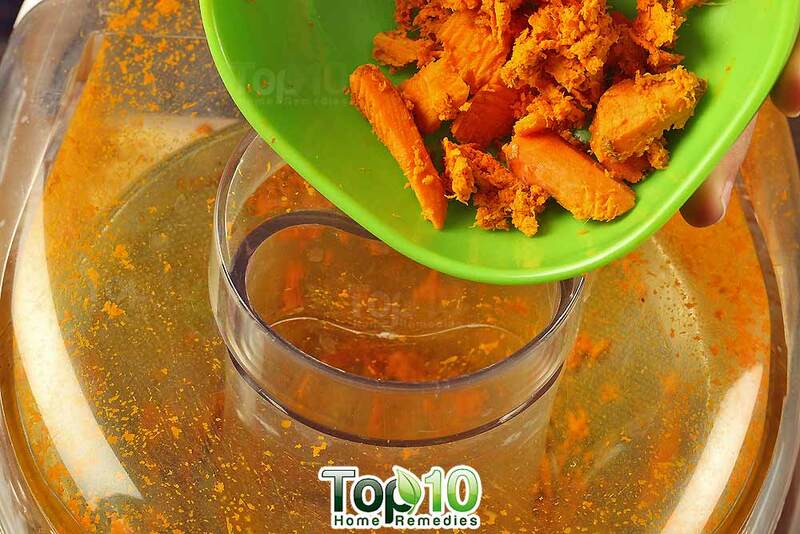 Wash a few pieces of fresh turmeric root thoroughly in running water and peel them. 2. Grind the turmeric roots in your juicer to get the juice. 3. Collect the juice pulp and run it a couple more times. 1. 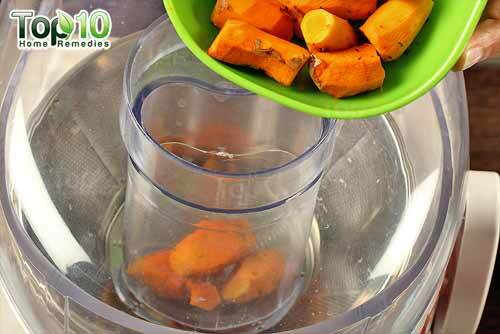 Put 1 to 2 tablespoons of fresh turmeric juice in a jug. 2. 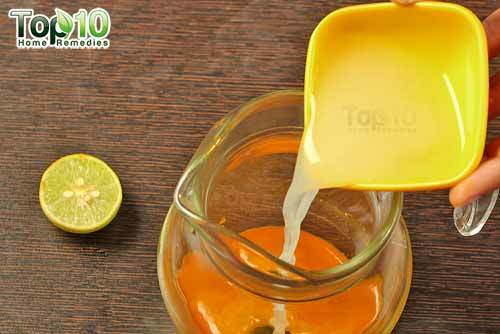 Add the juice of 1 to 2 lemons, depending on your taste. 3. Optionally, add a little ginger juice. 4. Add 2 tablespoons of raw honey. 5. Add 2 cups of cold water and mix the ingredients thoroughly. Keep the juice in the refrigerator and use it within the next 3 days. 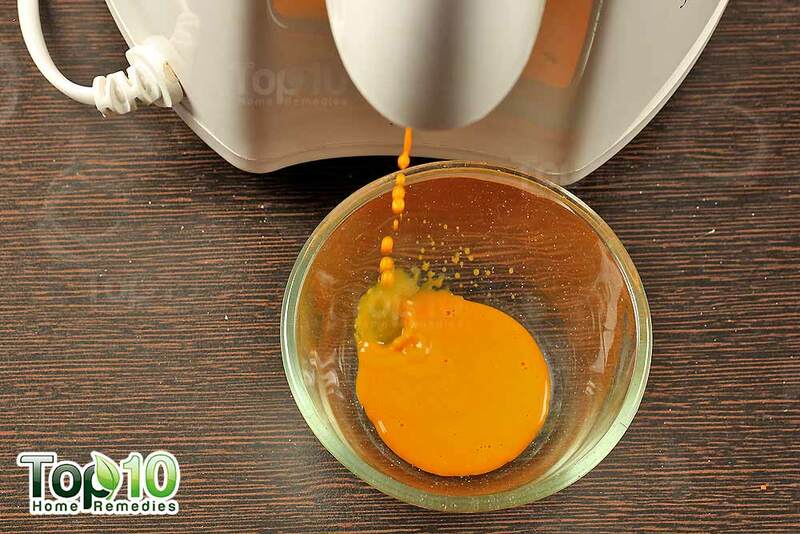 You can use this fresh turmeric juice in your smoothies, soups, turmeric milk or in cooking your favorite dishes. 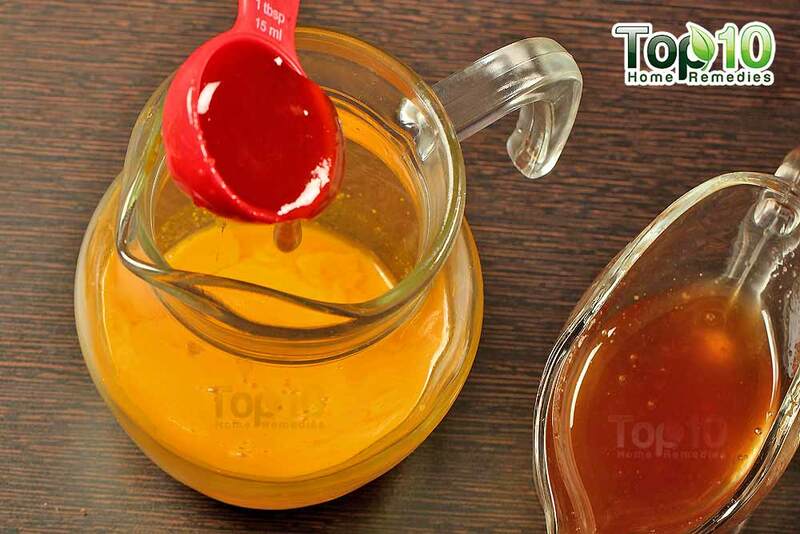 You can also extract turmeric juice by blending a few fresh turmeric roots along with a cup of water and then straining the mixture. 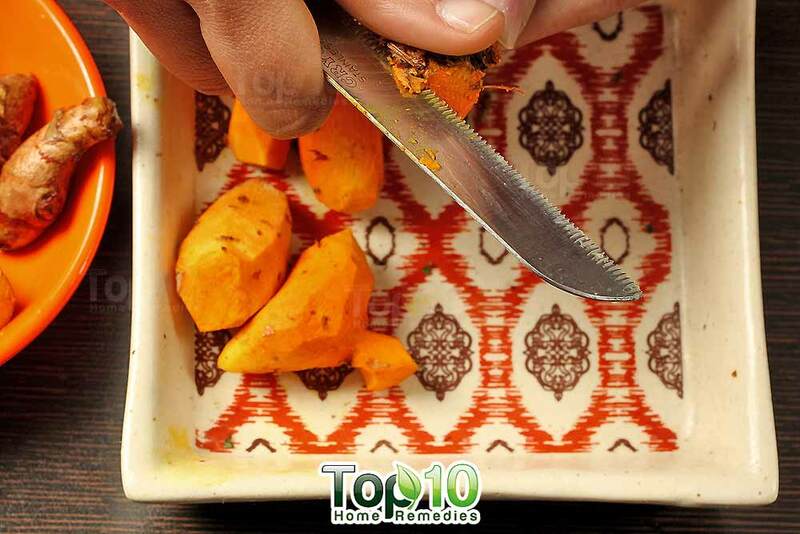 Another option is to simply grate the fresh turmeric root and strain its juice through a cheesecloth or a fine mesh strainer. 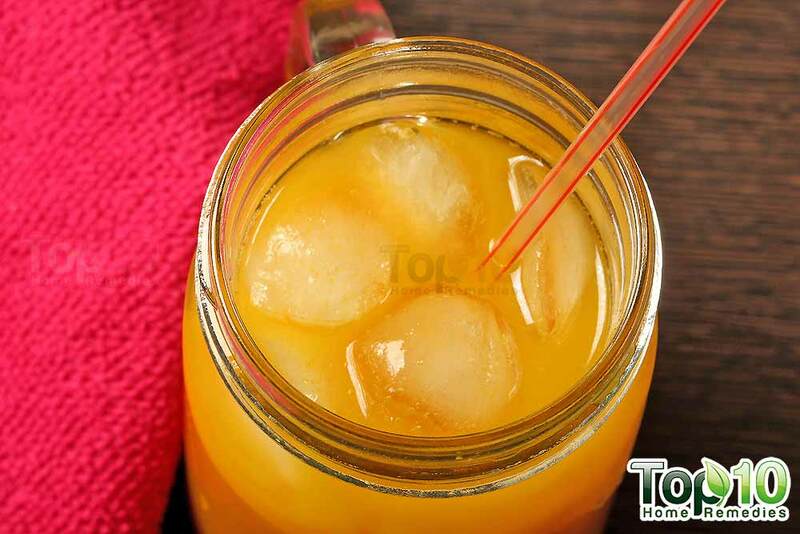 Here is a refreshing, healthy beverage recipe using turmeric juice. Serve this drink with ice, and store the excess juice in the refrigerator for a couple of days only. You can also flavor this healthy beverage with fresh mint or coriander leaves. 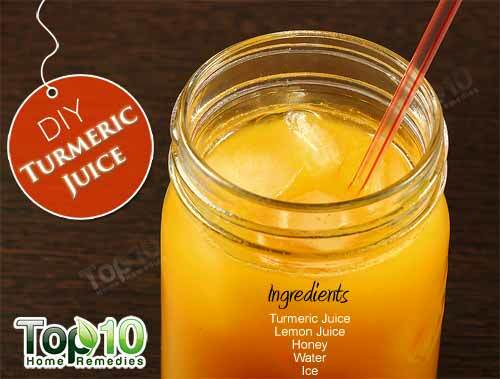 Turmeric juice is generally safe for most people. However, some may experience stomach upset. When taken in excess, it may also cause stomach ulcers. 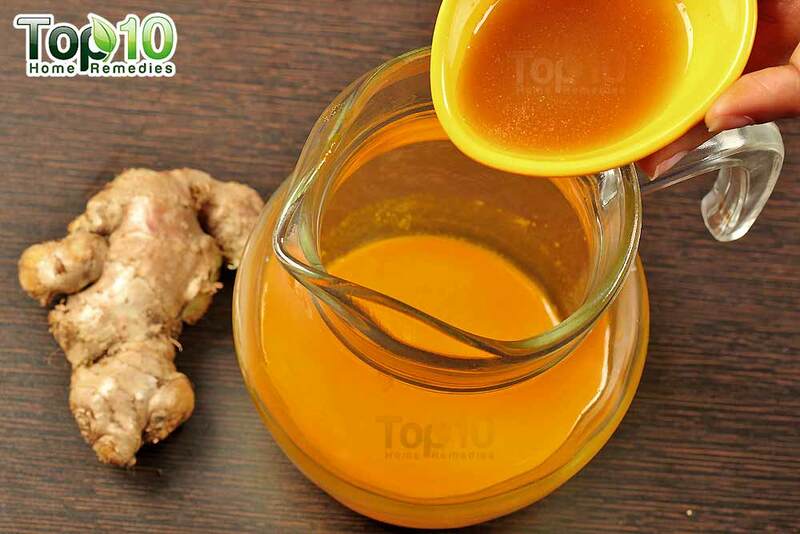 Moreover, turmeric may not be suitable for people suffering from gallstones and biliary tract obstruction. It also act as a blood thinner. Here are some of the health benefits of raw turmeric juice. Turmeric has a compound called curcumin that possesses anti-inflammatory and antioxidant properties. This compound even works better than non-steroidal anti-inflammatory drugs (NSAIDs) because it inhibits multiple proinflammatory pathways. Unlike curcumin, most NSAIDs are also associated with numerous side effects. Hence, turmeric juice helps reduce pain and inflammation, two common symptoms of arthritis, osteoarthritis and rheumatoid arthritis. The juice may even slow the progression of these diseases. Turmeric juice can be useful for preventing or delaying the progress of Alzheimer’s disease, which causes gradual memory loss. Inflammation is one of the main causes of Alzheimer’s disease. The anti-inflammatory property of raw turmeric reduces the brain inflammation by blocking the pathway of the COX-2 enzyme that leads to neural inflammation. In addition, regular intake of turmeric juice improves the flow of oxygen to the brain. This can also prevent or slow the progression of Alzheimer’s disease. 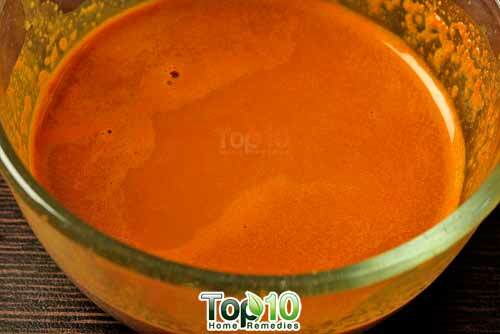 Raw turmeric juice is a potential treatment against cancer. The curcumin in turmeric helps the body get rid of free radicals and reduces damage to cellular membranes and DNA, which can otherwise raise your risk of cancer. Turmeric can help prevent or treat different types of cancer, including prostate, breast, lung, liver, oral, skin and colon cancer. You can enjoy the protective anticancer benefits of curcumin by adding a little raw turmeric juice to water and drinking it every morning on an empty stomach. In the case of indigestion, turmeric juice is surely one of the best home treatments. Turmeric stimulates the gallbladder to release bile, which aids digestion and reduces symptoms like bloating, gas, heartburn and constipation. 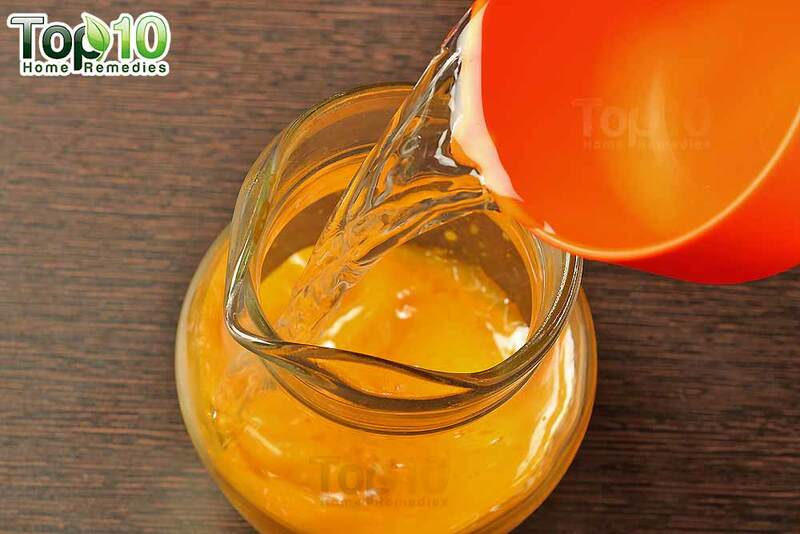 Moreover, turmeric juice improves digestion by increasing the body’s metabolic rate. Turmeric may also relieve symptoms of irritable bowel syndrome and ulcerative colitis. Eat a small piece of raw turmeric or drink a bit of turmeric juice with water daily to prevent digestive problems. Turmeric juice also helps keep your heart functioning properly. Curcumin helps lower low-density lipoprotein (LDL or ‘bad’ cholesterol) levels. Maintaining a proper cholesterol level can prevent many cardiovascular diseases. It also reduces the risk of strokes. Turmeric juice also controls the formation and buildup of arterial plaque, which is key in preventing atherosclerosis. It also helps prevent platelet clumping that contributes to clot formation. 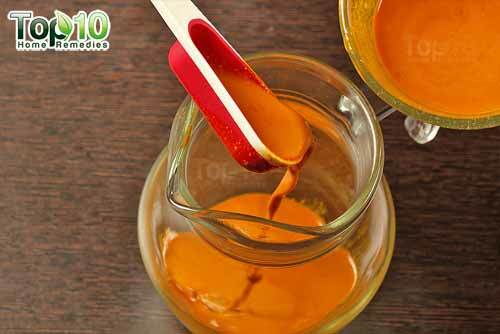 Another health benefit of turmeric juice is that it helps regulate blood sugar levels in people with diabetes. Turmeric helps maintain the proper functioning of the pancreas. This in turn helps regulate and balance insulin levels and prevent insulin resistance. It also increases the effectiveness of medications used to treat diabetes. To control your blood sugar, add 1 teaspoon of turmeric juice and ¼ teaspoon of black pepper powder to a cup of water and drink it once daily. You can also use undiluted turmeric juice or the paste of raw turmeric to speed up healing of minor wounds and cuts. Turmeric contains natural antiseptic and antibacterial agents that can help heal minor wounds and prevent infection. Its anti-inflammatory action relieves inflammation and pain. 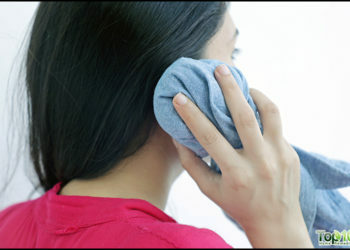 It also helps in the formation of new skin cells to close a wound. To stop bleeding from a wound, apply some turmeric juice. 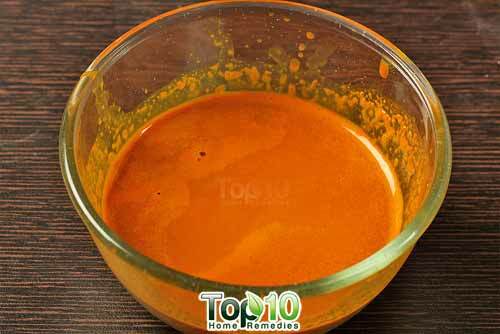 To promote ongoing healing, apply fresh turmeric paste on the affected area a few times daily. Turmeric juice contains antioxidants that help keep your skin healthy. 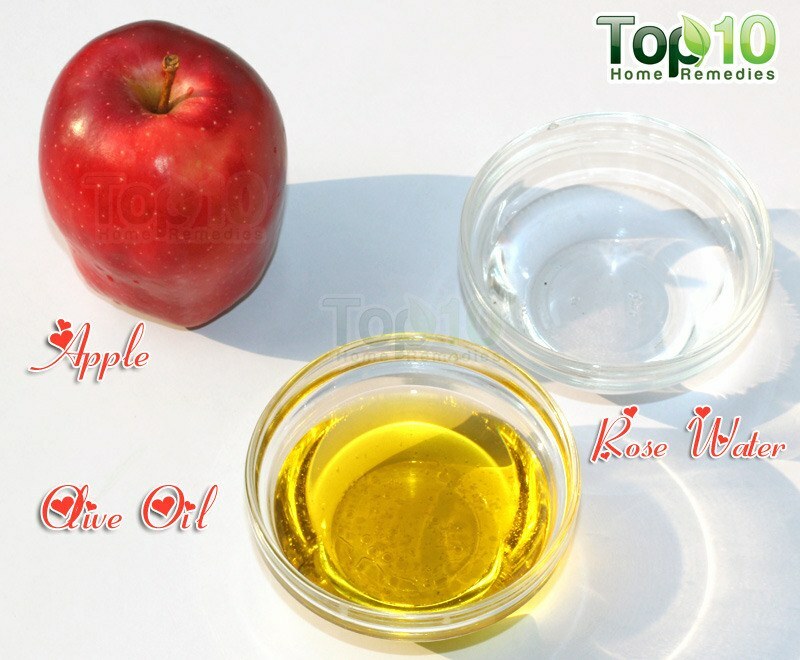 It helps in the treatment of acne, eczema, psoriasis and uneven skin pigmentation. To treat pimples and clear acne scars, apply a drop of turmeric juice on the affected area before going to bed. The next morning, rinse it off with water. To enhance complexion, add turmeric juice to your regular weekly face pack. Turmeric juice can stain your skin, but after washing the area with a cleanser and lukewarm water, the stain will come off easily. If i use the pure tumeric power,do i dilute with water.i have easier access to the powder. my understanding is that you need to add black pepper (1:4) in order for turmeric to be absorbed. Comments? Excellent ideas and it is very true too. Thank you so much for the information..l will try it.. I belief strongly in the curative powers mentioned by you in Turmeric and will follow it more in the coming days.Thanks. I find turmeric powder so difficult to blend, my drink always tastes gritty and if I strain it, I seem to lose half of what I’ve put into the mixture. I haven’t tried fresh root turmeric because it’s so hard to find. Any ideas. Thanks for the ideas. I’m trying to use organics instead of taking pharmaceutical meds made by man. I recommend as a morning tonic, 1 tumeric root juiced, half a lemon juiced with the peel, black pepper to taste, cayenne pepper, (just a touch) hot water and honey. The active ingredient in turmeric is curcumin which is absorbed and activated with the black pepper and coconut oil. The oil in the lemon peel has amazing health benefits as well. tastes better than it sounds.